Quintex offers a Ex px PC cabinet in different sizes and designs. All systems are available for hazardous areas (Zones 2/22 or 1/21). Depending on the specific application different performance PC can be used. Here all options are possible (e.g. an 'All-in-on' PC or a normal PC + a TFT screen from a computershop). 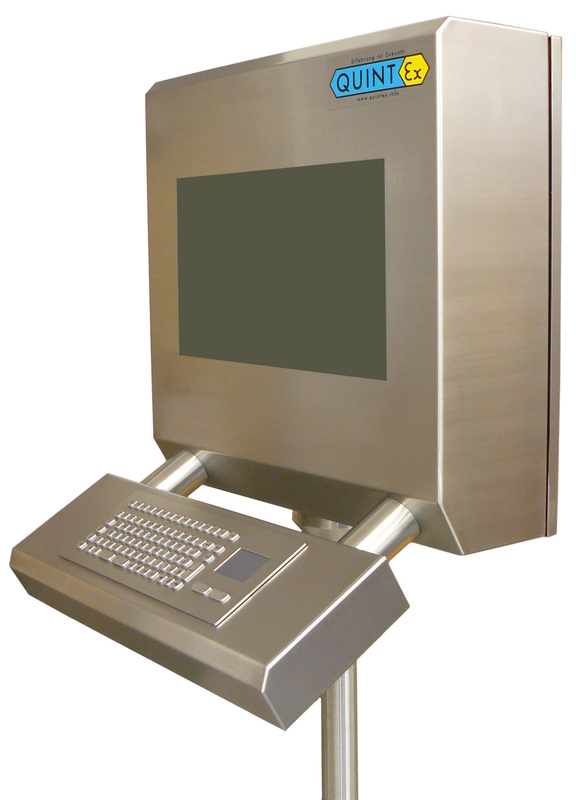 Mounting configurations are available as a support arm or pedestal . Different keyboards are available with mouse pad or trackball. To perform data connections from the outside into the cabinet, up to three interface modules with different interfaces are usable. To minimize the air consumption a valve module with a pressure-controlled leakage compensation is used. The 'Exfree zone' Quintex PC system works without purging, and is thus ready for use immediately after release by gas detection. The elimination of flushing time and pressurized air only for flushing makes the operation very economical. The release gas detection is made with commercial gas detectors.